If you’ve made up your mind to fuse metal for a living, then you’ve tackled the toughest part. Choosing a career. What’s next? There is more than one path to becoming a welder. How do you decide which is right for you? 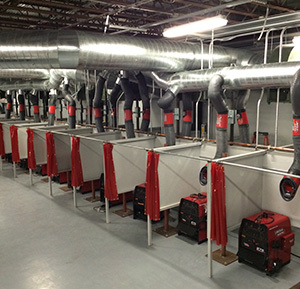 Comparing the type of instruction each option offers, how long it takes, the qualifications of the teachers and quality of the equipment and the cost can help you weigh your welding training options. Unless you took shop class in high school, the wide world of welding is probably totally new to you. Welding training can help introduce you to the practices, tools and techniques of the trade. Below is a look at what some of the most common training options could hold in store for you. As the name suggests, this training option focuses on one subject: welding. 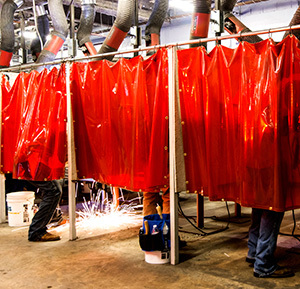 The goal of welding schools is to make graduates career-ready. This means hands-on training on the same kind of equipment used in the field. If you’re not sold on a career in welding and want to explore other fields, community college could be a good fit for you. This is typically a less-focused training path. You could take welding courses while trying out other trades like carpentry. Associate degree programs usually require students to take general education courses, such as math and writing. Classes in drafting, safety, reading and metallurgy might also be required for a welding degree. Credits or degrees earned at a community college can often be applied toward a traditional degree at a university. + Course credits can be transferred to a university. Some employers are willing to train applicants on the job, but most prefer those with formal welding training. It’s not uncommon for new hires with formal training to spend several months receiving on-the-job training. This is because employers might want them to learn skills specific to the job. And that’s exactly what you’ll learn if receiving welding training from a company. The training might not be as well rounded as at a welding school, however, and this could be a problem if you want to change jobs or work in other fields of welding. + Work while you train. − Learn a limited welding skillset. − Skills may not transfer to other companies easily. An apprenticeship is another option that allows you to “earn and learn” at the same time. Companies and labor unions typically run these programs. Apprentices usually work during the day and then attend night classes. They get a good understanding of the hours, physical demands and expectations of the job, which is unique from welding school or community college. Similar to on-the-job training, the skills learned may be limited to what’s required by the company. The U.S. government doesn’t list welding as an apprenticeable occupation, so it may be difficult to find a program focused on welding only. Some apprenticeships test applicants on math and hand tool use before allowing them to join the program. Entry can be competitive and waiting lists are common. + Earn while you learn. Learn more in Community College vs. Trade School: Career Training Comparison. Instructors may have more generalized experience with welding. Programs and equipment may be dated. Instruction can be poor because it’s often provided by other employees. This is problematic if safety procedures aren’t taught properly. The equipment provided would be specific to the job and could be dated. The quality of training and tools can depend on the master tradesman. He or she may employ older tools and methods. Usually free. Employees may be paid to train. Free. Apprentices are qualified to earn minimum wage. When choosing a welding training path, it’s important to consider training time, cost, what you’ll learn and the quality of the instruction and equipment. These factors can help determine whether you want to pay a little more for a streamlined training approach, experiment with other subjects while learning to weld or spend longer to earn while you learn. When it comes to preparing for a welding career, the more you know how to do, the greater the value you offer to potential employers. Select the training path that will best equip you for success in the field. Learn more about the possibilities after welding training in Where Could a Welding Job Take You?